Here we provide an overview of the economic impact projections from Pretis, Schwarz, Tang, Haustein, and Allen (2018). In this paper, we try to estimate the economic impacts of climate change in the future under 1.5°C or 2°C of warming compared to pre-industrial times. We chose these levels of warming, because the Paris Agreement – the main international legal instrument attempting to combat climate change – aims to limit warming to “well below 2°C above pre-industrial levels and pursuing efforts to limit the temperature increase to 1.5°C “. To estimate future economic impacts, we look at historical data to investigate whether development as society is linked to climate – in this case various forms of temperatures and precipitation (rainfall, snow, hail, etc.). Using data on GDP per capita and a number of econometric controls, we find that temperature and economic growth are related in a non-linear way (supported by previous research: e.g. here and here) – which means that warming can increase prosperity in cold places but decrease prosperity in already warm areas. Using these insights, we use simulated data of future climate that is 1.5°C and 2°C warmer than pre-industrial times to project economic impacts into the future. If we project the rate at which GDP per capita is growing every year, we find little statistical difference between the world we live in today and a world that is 1.5°C warmer than pre-industrial. For 2°C, we find a global reduction of growth rates of up to 2% for a large set of countries, showing that more ambitious climate action can avoid negative impacts (see Figure below). Using scenarios of how the global economy could develop until 2100, we also estimate that the median GDP per capita under 2°C will be 5% lower than under 1.5°C and overall 13% lower than current conditions. Furthermore, we find that the climate impacts are largest in poorer countries, increasing existing inequalities across countries. In the paper we assess the impacts of 1.5°C and 2°C onto economic outcomes by (i) first estimating historical relationships based on data from 1960-2014 between economic growth and climate, (ii) second, we create growth projections using a new set of climate simulations accounting for both uncertainty around future climate as well as uncertainty around the historical relationships between growth and climate, and (iii) third, we consider a scenario analysis creating relative projections of the level of GDP per capita using socio-economic scenarios. i) We use historical data on GDP per capita growth rates and a set of observed climate variables (temperatures, precipitation as well as the variability and maximum and minimum values for both temperature and precipitation ) to estimate a relationship between these climate variables and economic growth. ii) We use the estimated relationship from (i) to assess the impact of a temperature change of 1.5°C and 2°C (relative to pre-industrial temperatures) onto economic growth rates. For this we use a new set of climate simulations that target 1.5°C and 2°C warming specifically. We find that the impacts onto economic growth of 1.5°C are near indistinguishable from current conditions (the 95% range of projected growth impacts includes zero for most countries), while 2°C shows significant negative impacts onto the rates of economic growth (the 95% range falls below zero for a large set of countries). These projections solely depend on the target temperatures and do not assume these temperatures are reached in a particular year. 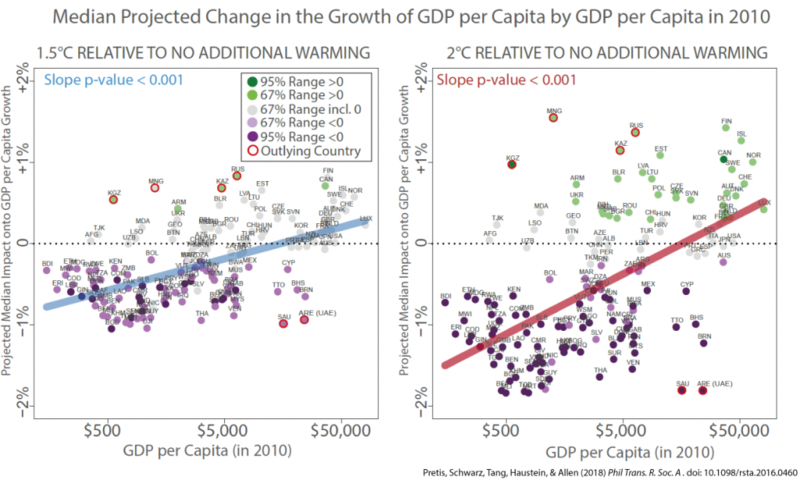 iii) We assess the impacts onto the levels of GDP per capita, by assuming that the target temperatures (1.5°C, and 2°C) are reached in the year 2100, and look at the level of GDP per capita relative to a set of base scenarios using the Shared Socio-economic Pathways (SSPs). We sample from the growth rates and climate outcomes from (ii) to assess uncertainties. In this relative scenario analysis, we find that the median outcome is a 13% reduction in the level per-capita GDP under 2°C, and an 8% reduction in per-capita GDP for 1.5°C warming. The correlation between climate-induced reductions in per capita GDP growth and national income levels is significant at the p<0.001 level, with lower-income countries experiencing greater losses, which suggest that further climate change may increase existing economic inequality between countries (see Figure below). 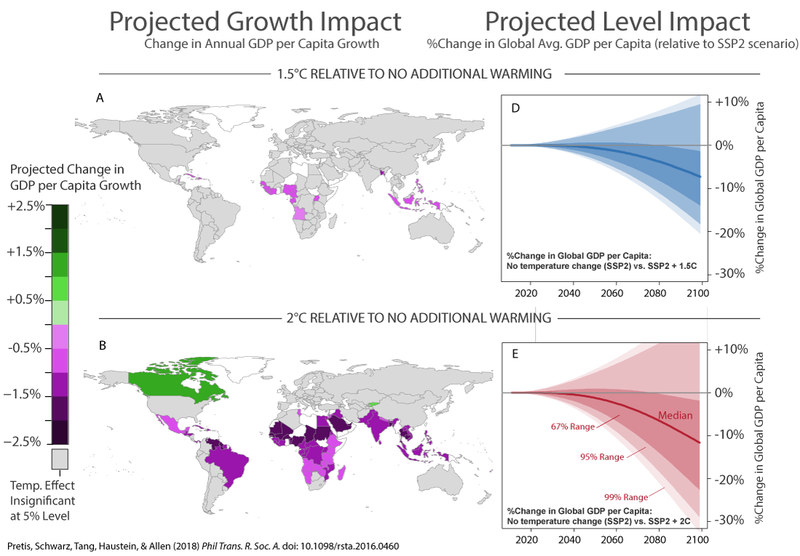 Maps show the projected median impact of 1.5°C and 2°C onto annual GDP per capita growth relative to ‘no additional warming’. Clicking on a single country shows the distribution of projected impacts for that particular country. The 95% (2 standard deviation) range of likely impacts is given by the interval of the 97.5th percentile and the 2.5th percentile. The 1 standard deviation range is given by the interval of the 83rd and 17th percentile. These ranges of projected impacts account for both estimation uncertainty (of the relationship between climate and economic growth) as well as climate uncertainty (range of projected temperatures). Climate projections are derived from the Half a Degree Additional Warming (HAPPI) project. The visualisations were created in collaboration with Our World in Data. Download data here or using the interactive maps below. Pretis, Schwarz, Tang, Haustein, and Allen (2018), “Uncertain impacts on economic growth when stabilizing global temperatures at 1.5°C or 2°C warming”, Philosophical Transactions of the Royal Society, A. 376: 20160460.